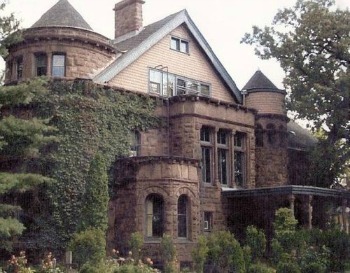 Sitting on Summit Avenue, in St. Paul, Minnesota, amidst other Civil War era mansions is a stately 10-bedroom mansion. This well-preserved home was named after it’s original owner, Chauncey W. Griggs. Griggs was a Civil War officer and a grocery tycoon who had this lavish Victorian home built in 1883. 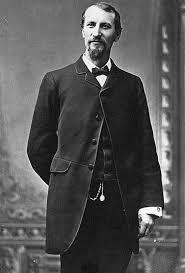 He however only lived in this mansion for 4 years before he headed west for more adventure and profits. Griggs Mansion as it is still known retains its beautiful wood paneled walls and stain glass windows. The original carriage house still stands in the back. 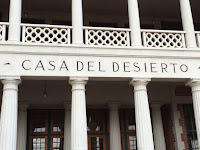 In the late 1930s the mansion was donated to an art school that stayed for 25 years. The school had a beautiful skylight placed above the top floor. 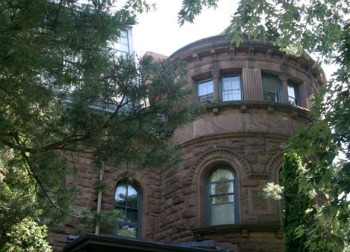 This art school was the exception for most who have owned Griggs Mansion over the past century have moved out quickly. This mansion is known to be St. Paul’s most haunted house—it has several ghosts and as a result a variety of paranormal activity occurs in the home. 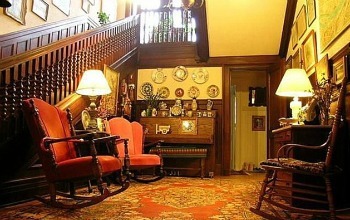 One of the most active ghosts is a maid who worked in the mansion at the turn of the 20th century. She committed suicide by hanging herself on the top floor’s landing after a failed love affair. A maid and butler that worked in the mansion first saw her ghost in the early 20th century. Her apparition has been seen in a white mist ever since. Many witnesses have felt her presence—stating they got an overwhelming sense of doom while standing near the landing. Another former employee haunts the library in the home. Charles Wade was the mansion’s obsessive caretaker and gardener. It is said he spend hours in the mansion's library doing research on how to do his work better. His apparition has been seen in this room and people have heard the rustling of pages of a book when no one else is around. When he died he was in the middle of a project in the garden. Some feel he lingers because of this unfinished business. In 1964, Mr. Waschke bought the mansion intending to use it as his home and office. While working at his desk in the library he saw a man with a long face, white hat and a dark suit who was glaring at him from the doorway. As he watched this apparition faded away. As he had the home renovated one window kept opening by itself—he finally had it nailed shut but the next morning it was open once more. Another ghost seen often is an old man with white hair who wears a black suit and top hat. This male ghost has been seen in several different rooms. In the early 1950s, Dr. Delmar Kolb joined the art school staff. He moved into a front basement apartment in the mansion. One night he awoke to two cold fingers pressed to his forehead. When he turned on the light he saw a blue flash that disappeared. Two nights later he was awakened again. He saw a man dressed in a black suit and top hat standing at the foot of his bed. This figure then turned and dissolved into a nearby brick wall. Students at this art school often reported as they drew on easels on the upper floor they felt something unseen looking over their shoulders. They speculated that it might be the maid who committed suicide on this floor. When the art school moved out of the mansion to their new building it is said the staff were relieved for they did not want to deal with unseen ghosts anymore. One story often told is about 3 skeptical journalists from the St. Paul Pioneer Press who stayed at the house one night in 1969 in order to do research for an article. These three stayed on the top floor near where the unfortunate maid had died over 50 years before. By 4:00 a.m. these three men fled the mansion in terror. They had heard heavy footsteps on the stairs heading toward the upper floor. One of these men braved the staircase on his own at which point he felt a presence near him. All three men then ran out of the house—the back way. 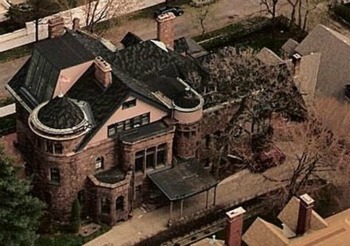 Recent owners of the mansion have discouraged paranormal interest in the home but they all have left quickly. Griggs Mansion was put on the market in 2012 but it has not sold. The price was reduced from 1.8 million to 1.1 million—but it was still on the market this year. This says a lot because anyone who owns the home can rent out the basement apartments that have the potential to bring in as much as $60,000 in revenue each year—that is if the tenants are willing to stay. In 1959, three students moved into one basement apartment. One of the three was awakened to see the head of a child floating above his bed. Other students that have stayed in these apartments claim they were shaken awake. Children sometimes have imaginary friends that turn out to be ghosts. Other posts that talk about this phenomenon are located here and here. 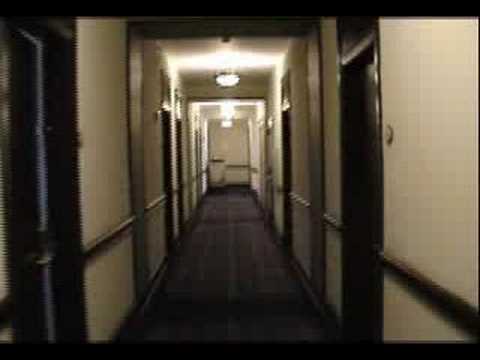 The following 1st person account is unique because this little girl, Sandra knew her “friends” were ghosts. When I was six years old my parents and I lived in an older house in southern California. 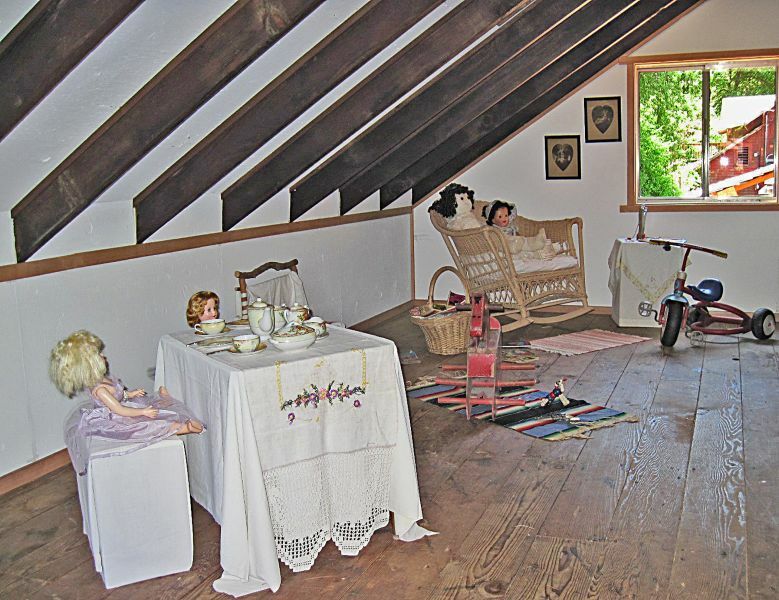 My bedroom was in the home’s attic. This room had other inhabitants besides me. I remember three figures that would float about the room. They were children like myself but taller so I believed they were older than me. I enjoyed their company, they visited me at night, but sometimes I refused to play with them wanting to sleep instead. At first I felt they were just other children but it slowly dawned on me that they were ghosts. I think this occurred to me because their facial features were unclear—it was like they had veils over their heads. I now know my belief that these night visitors were the spirits of children—was correct. They liked to play in front of my mirror but I don’t remember ever seeing their reflections. 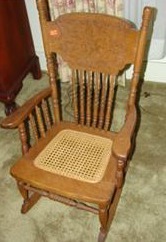 They also liked my rocking chair and we spent hours playing with my dolls and stuffed animals. I particularly liked it when we pretended to have tea parties. One night as they awakened me, I became irritated because I just wanted to sleep. I told them to go away. As I stumbled out of bed reluctantly the floor beneath my feet began to shake. I realized the whole house was shaking. It was an earthquake. I went to the doorframe, crouching down low. When this shaking subsided they told me to lie on my belly and slide down the stairs. When I reached my parent’s bedroom we were able to escape the house unscathed. Sandra * is grateful for these spirits presence when she was child. She feels they saved her from injury or even death. * Name has been changed at request of storyteller. Keaton on stage with his parents. Joseph Frank Keaton earned the name “Buster” after a family friend watched the 6-month-old child tumble down a flight of stairs in a boardinghouse and escape unscathed. Joining his parents on stage at the age of 3, Buster spent the next 15 years performing—he attended school just once for one day—during these years. In 1917 he joined his mentor Roscoe “Fatty” Arbuckle in making two-reelers—these films are classics today. More information about Arbuckle is located here. Starting in 1921 Buster produced his own films. 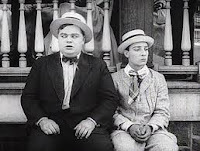 He had become one of the greatest comedic actors of the silent film era. His comedy and wild stunts are still watched today with appreciation. In his film Sherlock Jr. in 1924 when he walks up to a projected image in a movie house and walks into the image on the screen it became one of Hollywood's memorable film moments. He was a genius when it came to creating gags that involved mechanics. He always did his own stunts. His most famous stunt—was standing deadpan as a hinged 3-story house front fell around him as he stood in a window gap –there was only an inch and half clearance between this frame and his unprotected body. In another stunt, he broke his leg during the filming of The Electric Horseman in 1922. 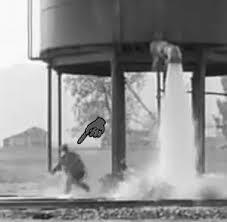 In a stunt, he did for Sherlock Jr. as he dropped from a rope he was blown off train tracks by water rushing out of a railroad refill tank. It wasn’t until later he learned his neck was broken. Both these stunts are highlighted in the video below. 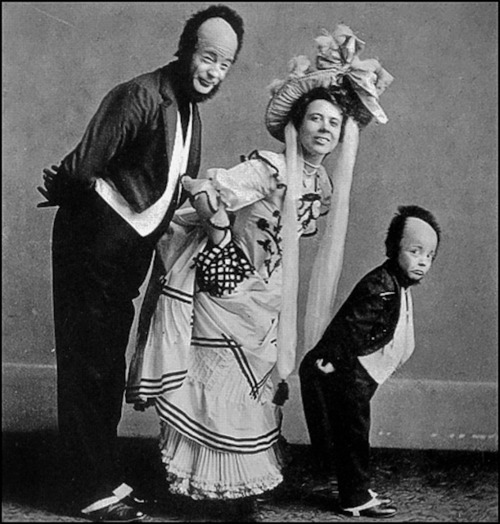 Like many comedians, Keaton also had a darker side. He was known to drink too much, like his father before him. It was supposedly a “drunken incident” with Louis B. Mayer in the early 1930s that led to Keaton’s dismissal from a contract, he had with MGM. This sent him on a downward spiral that ended his film career —another factor was the invention of talkies. In the 1960s he returned to film appearing in a series of “beach party” movies. Even though this was thought to highlight how far he had fallen Keaton himself stated he enjoyed this work. In 1960 the Academy Awards gave Buster Keaton an honorary Oscar for his film achievements. 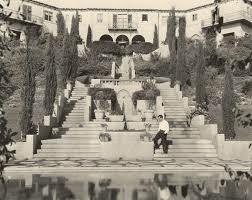 At the height of his career in 1925, Keaton had a 30-room Italian villa built on Pamela Drive in Beverly Hills. This home was surrounded by ten acres. His gardens had remote-controlled streams stocked with trout. The front of the house had a sixty step marble staircase lined with statues that led to a 50-foot Romanesque marble pool. To make grand entrances for his friends Keaton rigged his living room drapes so he could swing down from a second-floor balcony. Keaton had this home built for his wife Natalie Talmadge and two sons who moved into the house with Natalie’s mother. After the birth of her second son, Natalie decided she didn’t want any more children, so she moved into a separate bedroom. The marriage ended in 1932 in a bitter divorce. Partly became of Keaton’s drinking and party because of his extramarital affairs. Natalie changed their son’s last names to “Talmadge” and didn’t let them have any further contact with their father. She never remarried and died an alcoholic. 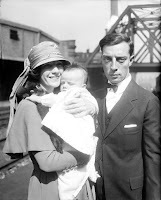 Keaton also lost his beloved home in 1933 after their divorce. After Keaton’s death in 1966, the subsequent owners of the villa felt Keaton’s ghost haunted this property. His ghost became a “slightly annoying presence” for these owners—for his spirit is playful. 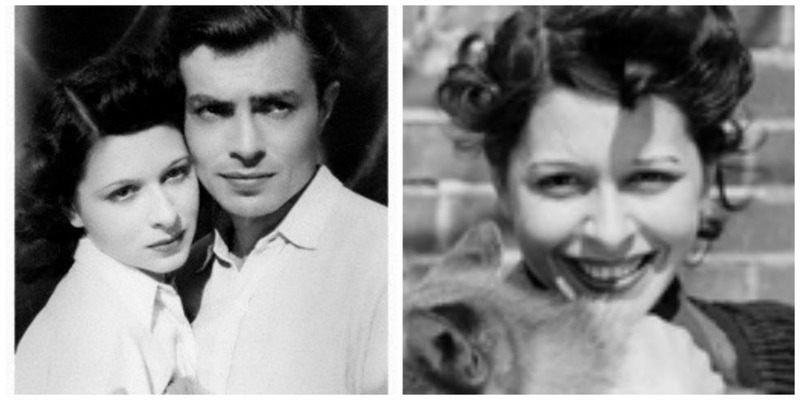 Pamela Mason divorced the English actor James Mason in the late 1960s. She was one of the first high profile clients of Marvin Mitchelson, the divorce lawyer who pioneered the right to palimony. Pamela before and after divorce. Pamela like her husband was an actor. She starred with her husband in a television series called The James Mason Show. Mason lived in Keaton’s former house for 25 years. During this time she was plagued by the lights mysteriously turning off and on and the telephone wires malfunctioning. Buster’s ghost also fiddled with the water faucets, doors, wall hangings and any other object he could move to gain her attention. Pamela Mason had a fatal heart attack in this house in 1996. Some believe her ghost has joined Keaton’s in haunting the property. This villa has ironically been used in recent years as a “Haunted House” attraction during the Halloween season. 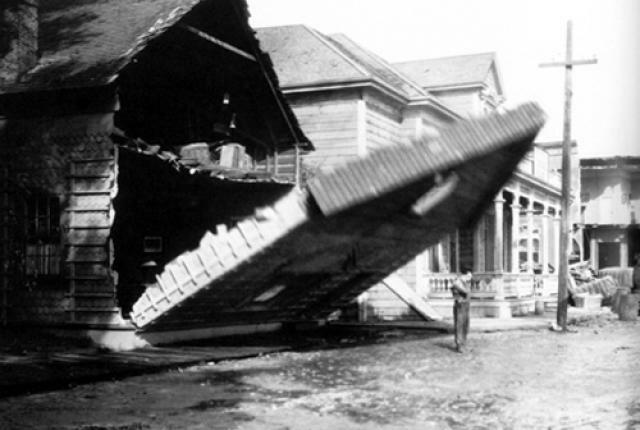 The following short video is a compilation of Keaton’s best film stunts. The Harvey House hotels and restaurants played a defining role in civilizing the West—by the 1880s there was a dinning facility located every 100 miles along the AT&SF. In Barstow, California on North First Street sits one of the 84 Harvey Houses that were built in the Western United States by the Atchison, Topeka, and Santa Fe Railroad to provide quality food and service for its passengers. After the turn of the 20th century Harvey Houses were designed by professional architects to reflect the culture and natural terrain where they were built. 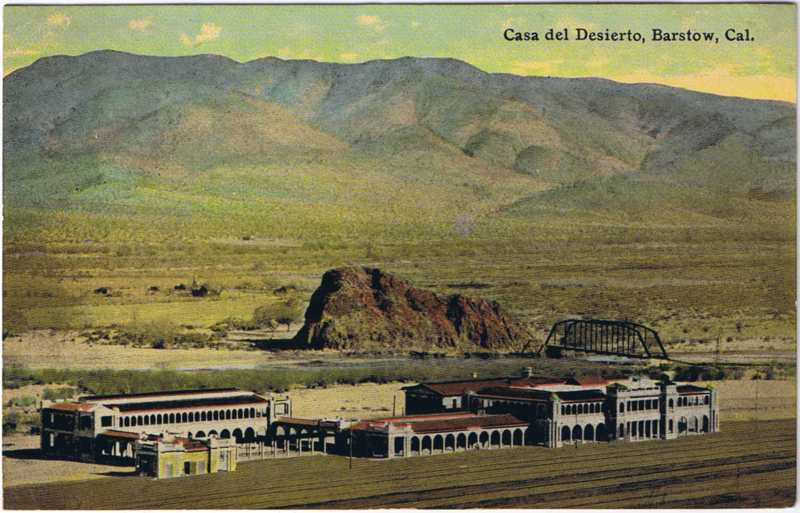 Casa del Desierto or House of the Desert was a train depot, hotel and restaurant designed by Los Angeles architect, Francis Wilson in 1911 after the original wooden Harvey House hotel in Barstow burnt down in 1908. Wilson’s design reflects traditional Spanish and Native American themes with Moorish influences. 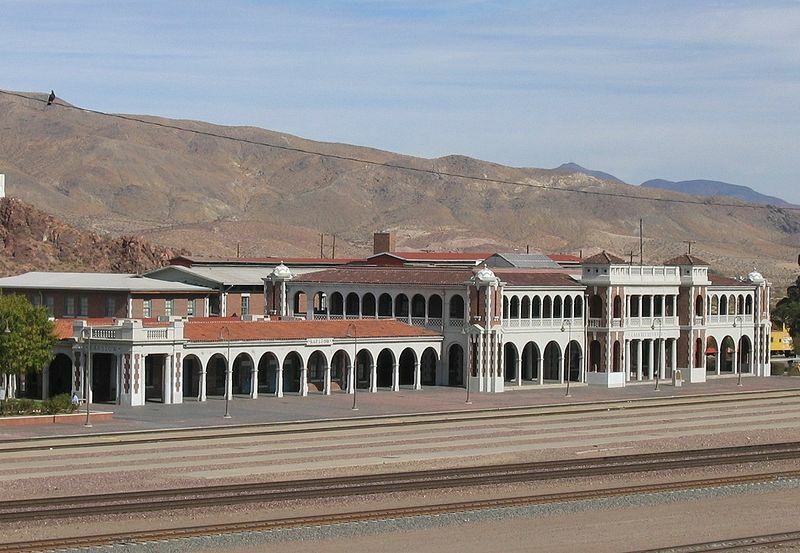 The old depot is a California Historical Landmark today and is now used as a museum. Ghost tours are given in this building because it has a lot of activity. 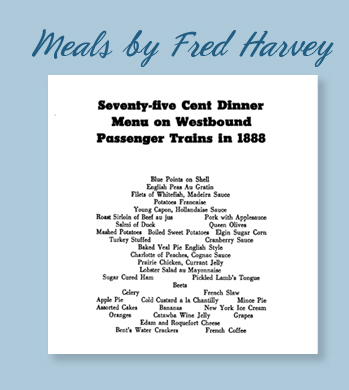 The waitresses tasked with serving the fine food * at Fred Harvey’s Houses ** were known as Harvey Girls. These young women—between the ages of 18 and 25 were selected carefully. Harvey Girls at the Casa. Many women who applied were turned down so it was considered an honor to be picked as a Harvey Girl. These women were held to a strict set of rules. They had a 10:00 p.m. curfew that they had to adhere to everyday of the year so that they would be rested for the next day’s work. They wore a black and white uniform that had to be pressed before each shift. 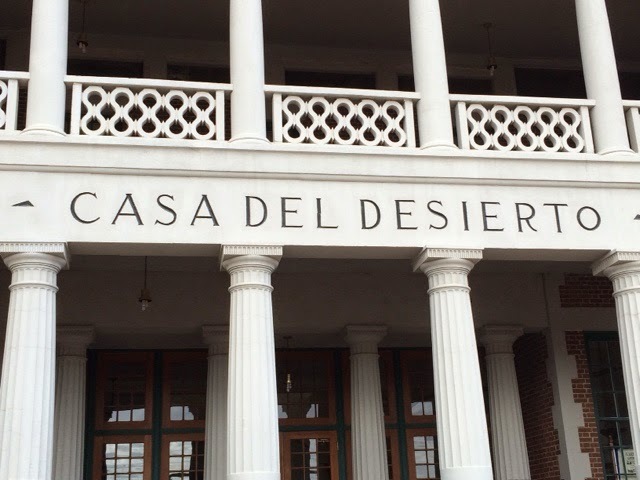 A Harvey Girl by the name of Rachel worked at the Casa del Desierto in the 1920s. She haunts this old depot. She is seen near where the formal dinning room was located. Witnesses report seeing her take orders from customers that are not there. She is also seen walking from the kitchen area holding an object in her hand. A more recent story told is she is seen on the balcony at the Casa –it is stated she waits for her fiancé to return from the war. It is believed she committed suicide when he did not return. Another ghost seen at this depot is of a little girl named Emily. She is seen playing peek-a-boo with visitors near the staircase in the lobby. 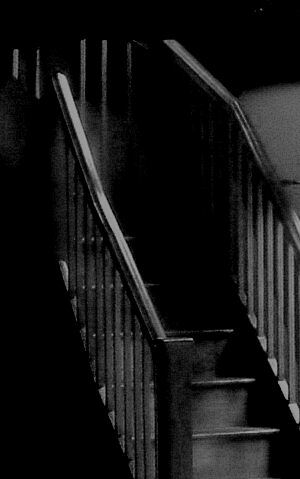 This spirit is known to follow people around when they are upstairs. Yet another spirit is a man by the name of Buchanan. He announces his presence with a strong aroma of smoke. He was crushed to death between two railroad cars in the depot’s yard. His last request before he died was to see his family and have one last cigarette. Many witnesses have experienced rapid temperature changes at the Casa. These temperatures become warmer of colder between 20 to 70 degrees within minutes. 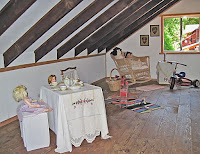 Voices of both children and adults are heard and shadows or dark figures are seen. People that are more sensitive have reported feeling chills on their neck and hands and a tingling sensation on their arms. Other reactions include a feeling of being uncomfortable, becoming dizzy, lightheaded or even nauseated. In my experience the above feelings are classic examples that a place is truly haunted. Blue Points on Shell, English Peas Au Gratin, Filets of Whitefish with Madeira Sauce, Potatoes Francaise, Roast Sirloin of Beef au jus, Salmon or Duck, Mashed potatoes, Boiled Sweet Potatoes, Turkey Stuffed, Cranberry Sauce, Baked Veal Pie English Style, Pork with Applesauce, Pickled Lamb Tongue. French Slaw, Queen Olives, Elgin Sugar Corn, Charlotte of Peaches in Cognac Sauce, Prairie Chicken, Current Jelly, Lobster Salad au Mayonnaise, Sugar Cured Ham, Beets, Celery. Apple Pie, Assorted Cakes, Bananas, Cold Custard la Chantilly, Catawaba Wine Jelly, Edam and Roquefort Cheese, New York Ice Cream, Grapes, Bent’s Water Crackers, French Coffee. A meal cost 75 cents. 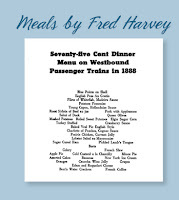 ** Fred Harvey while working for the railroad in the late 1800s noted “a decent lack of food for railroad travelers.” He then pitched his idea to the company to open fine dinning restaurants. His Harvey Houses were the first restaurant chain in America. They introduced the concept of Blue Plate Specials. 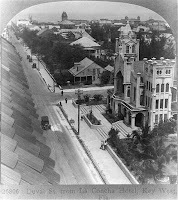 In Part l of this post sightings of the ghost seen most often at this historic hotel in Key West, Florida are shared. The La Concha opened in the early 1920s and hosted many famous people in its heyday. It was renovated in the 1980s and since 3 ghosts have been seen. 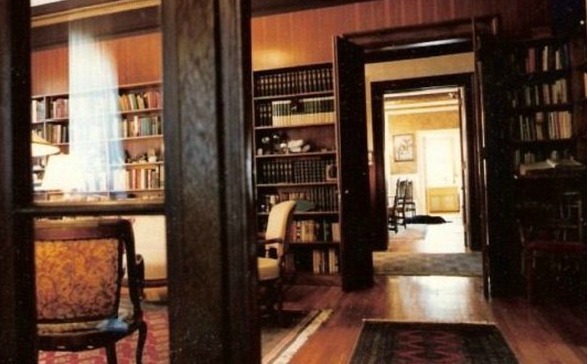 One of these ghosts * is believed to be the spirit of Ernest Hemingway because it is seen in the suite where he stayed with his mistress—Martha Gellhorn who became his third wife-- in the 1930s. His ghost is mischievous for he often moves objects. One guest who stayed in the Hemingway Suite was annoyed by activity that prevented him from going to sleep. He had climbed into bed when he saw a video recorder fall from the dresser he had placed it on. He got up and placed it back on this shelf. But once he was back in bed the recorder once more fell to the floor. He picked it up again. He checked the dresser to see if it was wobbly but determined it was stable. When he got back in bed—he turned the light out but watched the dresser this time. He saw a dark figure in one corner by the bathroom—it was slightly crouched down. He saw the recorder fall for a third time. He got up quickly, flipped the light on but found no one else in the room. He arranged to move to another room. It appears Hemingway doesn’t like others in his space. * Florida’s Ghostly Legends and Haunted Folklore, by Greg Jenkins. The third ghost seen at La Concha is the spirit of a lawyer who was in trouble with the law in the 1980s. He was being investigated for embezzlement and fraud and knew he faced prison time. He came up with a strange plan to commit suicide and make it look like a murder so his family could collect insurance money. He left a rambling recording of statements that implicated his secretary in the crimes and stated that men were coming to assassinate him. He then leapt from one of the hotel’s balconies recording his screams as he fell to his death. But this plot to clear his name and help out his family failed. The authorities had too much evidence that pointed to his guilt. Since this bizarre death, many witnesses at sunset have seen a middle-aged man walking frantically back and forth on one hotel balcony. Several of these people have called hotel security thinking this man was about to jump. However, in each instance security guards found no sign of anyone on this balcony. A couple sitting in a room below this balcony called the front desk in a panic. They reported seeing a body falling past their window. Afterwards no body was found on the premises. It appears this dishonest lawyer is doomed to play out his death over and over again. This ghost is also seen on the roof of the hotel. 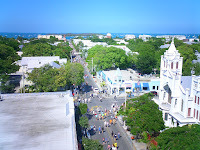 The La Concha is officially called Crowne Plaza Key West today but the old name is still used. 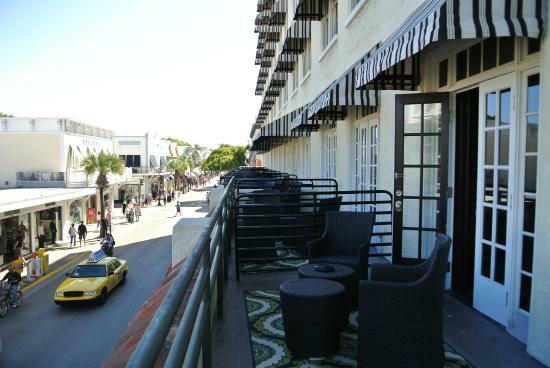 A tour of haunted Key West landmarks starts in the lobby of this hotel. In Part l of La Concha Hotel, read about the ghost of a hotel waiter who died in an accident on New Year’s Eve. 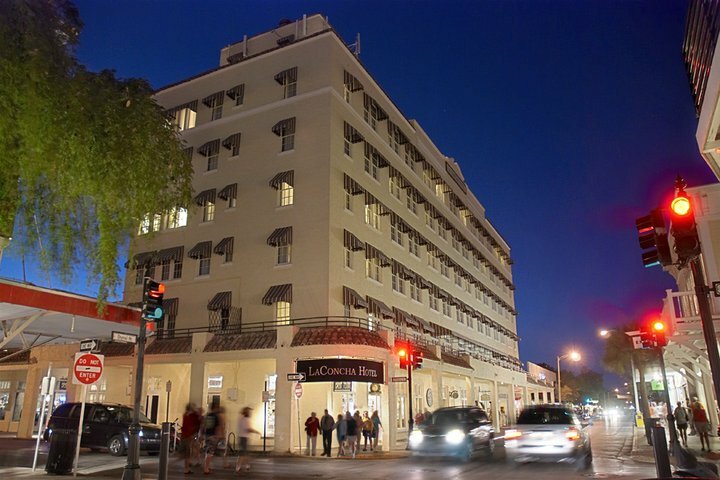 The La Concha was built in 1924 giving Key West, Florida its first luxury hotel. 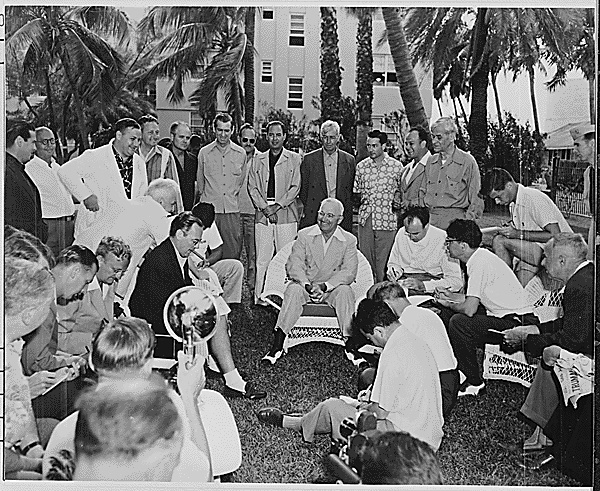 It quickly became the playground for U.S. presidents, gangsters, European royalty, and famous authors. This hotel remains the tallest building on the civilian side of Key West and is on the National Register of Historic Places. 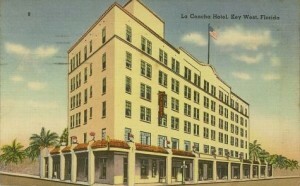 Ernest Hemingway frequently stayed at the La Concha in the 1920s, 30s and 40s. It is said he wrote several of his novels at this hotel. He also entertained his mistress—his future 3rd wife-- in the hotel’s bar and in his favorite suite. View from rooftop in 1926. By the late 1940s the hotel had fallen on hard times. La Concha’s rooftop bar with its spectacular views was the only part of hotel that remained open. In the early 1980s architect Richard Ruth took on the task to restore this hotel to its former glory. 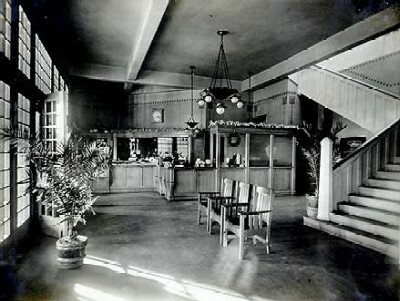 The hotel reopened in 1986. Ruth’s efforts succeeded for many guests note the feeling of the past when they stay at the hotel. But for others this unique atmosphere has taken on a spooky feel. For they have seen one of the three ghosts that are known to haunt the La Concha. 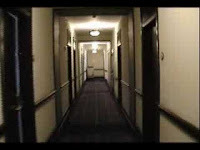 The ghost seen and felt most often is the “tormented spirit” of a waiter who worked at the hotel in the 1980s. It was New Year’s Eve at 1:45 a.m. and this waiter was hurrying to get back to the kitchen with a loaded cart. He cleaned up and placed stray party decorations—streamers and confetti on his cart as he made his way to the 5th floor elevator. He pushed the button and heard the elevator door open. He had his back to the entrance as he pulled his cart into what he thought was the elevator—but he stepped into an empty shaft and fell 5 floors to his death—his cart landed on top of him. The elevator had malfunctioned and stopped at the 6th floor above him instead. The hotel chose to keep this accident quiet but soon after staff and guests began to have strange experiences. Many employees while on the 5th floor stated they felt they were being watched. Others reported having their shoulders tapped when the hall was empty. To this day, hotel maids refuse to work on the 5th floor alone. This ghost is also seen in the hotel’s kitchen. There have been reports of cooks seeing this ghost pushing a cart in one corner of this room. Others have found colorful streamers and confetti on the 5th floor landing near the elevator when no celebrations have occurred. One janitor who went to retrieve a vacuum to clean this mess—returned only to find the party decorations gone. Various staff members have reported that their carts have been moved overnight. These carts are then found sitting near the entrance to the 5th floor elevator. Guests have reported hearing a squeaky cart pass their rooms late at night. They also report seeing a waiter walking down a hall on this floor late at night. They state this figure walked stiffly as if in a daze. One guest tried to engage this figure in a conversation but it ignored him and turned the corner. This guest then followed the waiter only to find no one in the next hallway. Yet other guests have heard sounds of a party—when there is none. They report hearing muffled laughter and music echoing down the hall. In Part ll of La Concha Hotel, two other ghosts seen, including the ghost of Hemingway, are described.